When you first began hearing the soft cooing calls of the pigeons, you began to wonder if you had accidentally moved to New York City. Unfortunately, these members of the Columbidae family are not relegated only to the Big Apple. Pigeons will go anywhere there is a nice place to land and perch, a food source of fruits and seeds, and a place to roost. If your property fits these qualifications, the pigeons may come to stay. 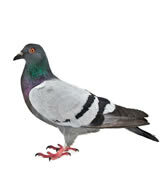 Pigeons really enjoy roosting in the eaves of your home and in the attic and roof areas. They will find any little entry point and proceed exploit it for a place to roost. Your Critter Control technician will be able to properly clean up and sanitize the areas affected by the pigeon droppings to restore your property back to its pre-pigeon glory. This is the beauty of using Critter Control for your pigeon problems, because not only do we rid you of their presence but we also clean up the mess they leave behind. The best way to control pigeons is to take away their roosting place by sealing off entry points permanently or by placing netting or wire over the eaves of the roof. Fence spikes can also be used to deter the pigeons from landing on your property, as they like to be comfortable. Pigeons can also be humanely contained and relocated to speed up the process of evicting them. Remember though, you can’t just relocate them without adding in deterrents, because they will return again if not discouraged.